In our second partnership with One Acre Fund, we’ll be following David and Zipporah, smallholder farmers from Kenya, for a whole growing season. From planting to harvest, we will check in every month to see what life is really like for a family making a living from agriculture in rural Kenya. Read part 1, part 2, part 3 part 4 and part 5. Written by Hailey Tucker. 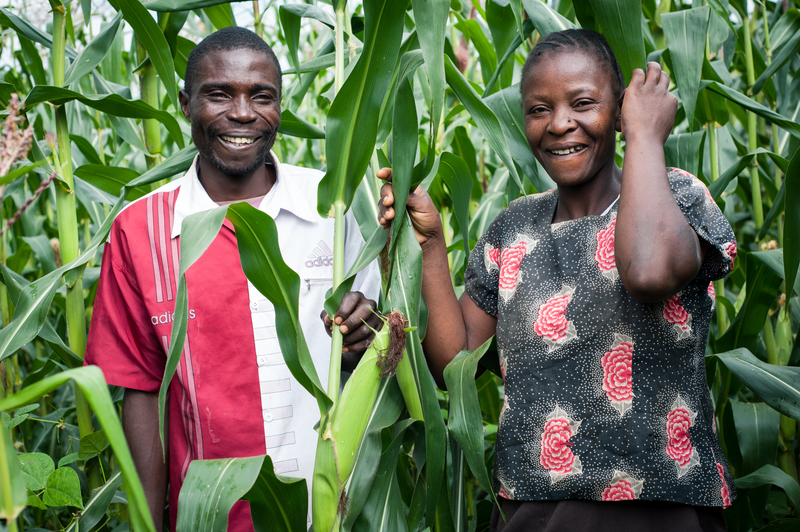 David and Zipporah with their maize which is almost ready to harvest. Photo: Hailey Tucker. David and Zipporah’s maize now towers tall above their house. From the front door, they can no longer see across their field to their neighbours’ homes. Instead, they see a dense forest of maize stalks and bushy bean tangles. Despite what looks to be a promising harvest, the couple is anxious. Zipporah is noticeably thinner than earlier in the year, and although David smiles when he speaks, he admits he is concerned. In the last month, the couple has been weeding other farmers’ land to earn money to buy food. For each row they weed, they earn 20 Kenyan Shillings ($0.22 USD). Unfortunately, the length of maize rows varies greatly depending on the shape and size of the land, and despite the fact that some rows take several hours to weed, their pay is not adjusted accordingly. “This is the worst hunger season we’ve faced, and it’s because last year was a bad year and now the cow we were depending on for milk is gone,” Zipporah says. The family of six are now eating just one meal a day: a single pot of rice for everyone, served with tea. Looking toward harvest time, the couple is confident that all of their crops will produce good yields this year, which is promising after the poor harvest they faced in 2013 because of unusual weather. They also expect their remaining cow to give birth in August, after which it should start producing milk. “Things are hard at the moment, and there’s still one month until harvesting. I’m thinking about how that one month will end,” Zipporah says. Gazing out to the tall stalks of maize, David and Zipporah remind themselves there is an end to the hunger in sight. In the next month, they will begin harvesting their beans and collard greens, and they say this will bring them much needed relief. David plans to use his bicycle to take the collard greens to the market to sell, and Zipporah plans to begin cooking beans for meals as soon as they are ready to pick. “Right now it’s difficult, but it’s normal to have difficult moments and easy moments in life,” Zipporah says.